I wanted to do a Halibut recipe that inspired me by Giada de Laurentiis, but on Sunday in a small town Halibut was not to be found. Fresh Cod was available, and it was a fine substitute. The Olive Caponata took a while to prepare, but it was worth every minute. The pan sauce was simply Butter and Vermouth reduced to a glaze. Not quite a dieters’ dinner, but close. 1. In a large skillet, heat the EVOO over medium high heat. Add the Onion & season with Salt & Pepper. Cook until translucent, about 3 minutes. 2. Add the Celery & Artichoke Hearts and cook until soft and the Artichokes are lightly browned, 3 to 4 minutes. Add the Tomatoes, Olives, & Raisins to the pan. Simmer over medium low heat, stirring frequently, until the mixture thickens, about 25 minutes. 3. Stir in the Vinegar, Sugar, & Capers & season with Salt & Pepper to taste. 1. Place a nonstick grill pan over medium high heat. Lightly oil the pan before grilling the fish. 2. Drizzle the Cod on both sides with EVOO. Season on both sides with Salt & Pepper. Grill until the flesh flakes easily with a fork, 3 to 4 minutes on each side. 3. Remove the Cod to plates & add Butter & Vermouth to the pan. Reduce until slightly thickened. 4. 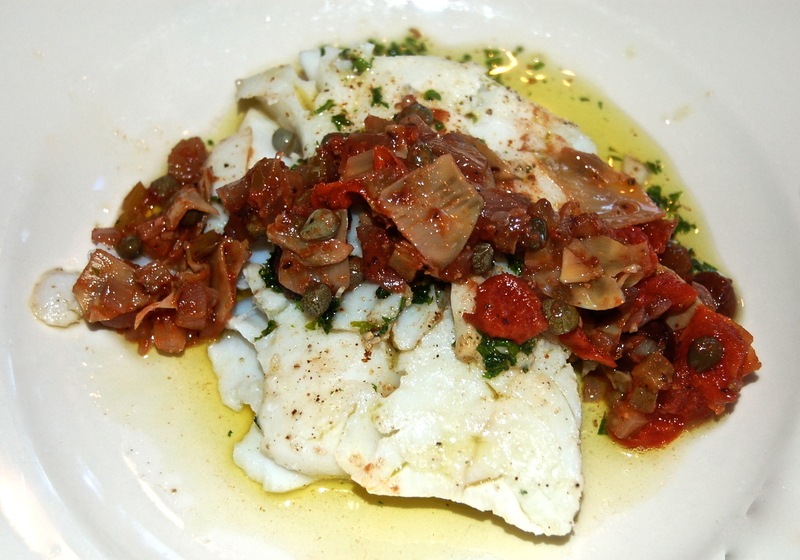 Spoon the pan sauce over the Cod & top with the Caponata. Garnish with chopped Parsley & serve. A little butter brings out flavor and isn’t a bad thing. Your meal sounds delicious.